Our mission at Skagit Farmers Supply is to support agriculture and although we’ve seen dramatic growth since our founding in 1934, agriculture is still the heart of our business. We are a diversified agricultural cooperative: our members own us and provide governance to us. We strive to provide quality goods and services to our many customers across our four business units. Our agronomy department supports organic & conventional production agriculture and small acre rural living enthusiasts. Our energy department provides for safe and trusted propane delivery as well as refined fuels and lubricants. Our retail Country Stores cater to everyone from pet owners and gardeners to ranchers and farmers. Our AFCO Wholesale & Milling department provides many of those same farm store goods in much of the northwestern United States as well as offering locally sourced, all natural Aslin-Finch Feeds. We’ve had good continuity on our board of directors and with our management and this allows us to stay true to our cooperative values and keeps us committed to our communities we do business in. 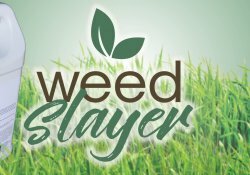 One product the team at Skagit Farmers Supply recommends is Weed Slayer — an organic solution to natural grass and weed control!